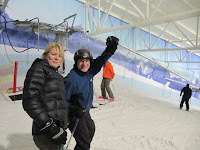 As the Parkhouse design team spend a day skiing indoors at Manchester's real snow ski slope, Chill Factore. It was Ben's first time on real snow and he was given a 1 to 1 lesson with Steve Smaje one of DSUK's instructors. Viv, Jo and Jonny were all blasting away on the slopes for a few hours!